Brand New and Modest Mouse brought their summer co-headlining tour to the World’s Most Famous Arena Thursday night. For Modest Mouse it was a night in the iconic venue, for Brand New, it was a hometown throwdown for the Long Island heroes. The two bands toured together two years ago and it came as no surprise that they reunited on the road for another outing. Each night on the tour, a different band closes, for New York, it was no surprise that Brand New were the favorites to finish the night. 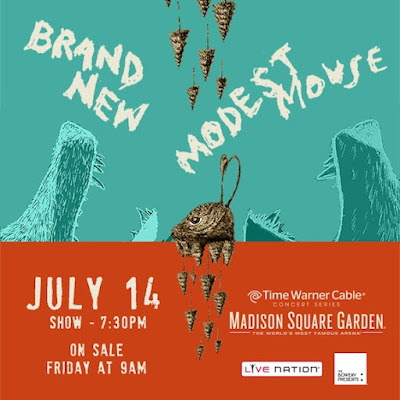 While it was joint venture, it often times felt that Modest Mouse was just an opening act for the Long Island rockers. The eight-piece band from Portland brought their massive catalogue to life and brought some hits, some rarities and some fan favorites. Singer Isaac Brock hardly spoke to the crowd but they just barnstormed through their set without any interruption. Songs like “Bury Me With It,” “Lampshades on Fire,” “Tiny Cities Made of Ashes,” sounded crisp inside the venue. While tracks like “King Rat” and “Dashboard” had fans thrilled, the band calmed things down with “Dramamine,” “Wicked Campaign,” and “Night on the Sun.” Some inside began losing interest, while fans of Modest Mouse were thrilled. It was a divided set among fans but following their 90-minute performance, it was time for Brand New. The enigmatic emo-punk band has been teasing that this tour could very well be their last. In fact, it seems as if whatever impending record they allegedly have coming this year will be their last. No one knows what tricks Brand New has up their sleeves but one thing was for sure, the 20,000-plus inside the sold-out arena were ready for whatever they wanted to throw at them. The starkly lit stage featured flowers around the microphone stands, almost as if it were a wake for the band before a funeral. “I love New York,” singer Jesse Lacey said as soon as he walked on stage. Opening with “Sink,” “Gasoline,” and “Millstone” fans were jumping for joy straight away. Guitarist Vinnie Accardi looked as if he was having the time of his life as he slayed his axe across the famous stage. Lacey, known for being a moody frontman, seemed to be enjoying himself, though with him you can never tell. The band sounded together, loud, and explosive. If this were to be their final New York show, they were doing it on their terms but also at their thunderous best. As the clock went past 11, songs like “Luca,” “Jesus Christ,” and “Sowing Season,” brought the set to a close. While each night on the tour, both bands got 90 minutes, Brand New stretched their New York performance to almost two hours, performing for an hour and 45 minutes. Taking the stage for the encore, Lacey thanked everyone and his parents for supporting the band over the years and said: "This is a Long Island song," before going into "Play Crack the Sky." The band, who skipped songs from their debut, Your Favorite Weapon in the setlist, finished with "The Quiet Things That No One Ever Knows" and "You Won't Know," before leaving the stage, for what could be their final concert ever in New York. As they retreated to the wings, the screens behind them lit up with "Brand New 2000-2018."